Probably not, but that’s okay because it’s my fault. Let me re-introduce myself. I’m Angelica and I hope you guys are doing well. A lot has happened since my last post, which was back in April of this year. 1. My sister and her fiancé announced they were expecting their first child!!! 2. My youngest daughter turned 4 years old and we had a party at the bowling alley! 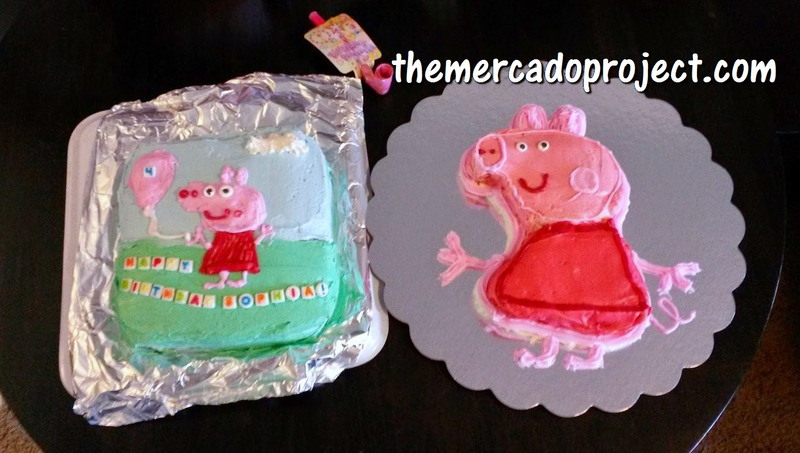 The theme was Peppa Pig and my husband made her TWO cakes! Yes, my hubby made those cakes you see below! 3. My daughter received a certificate in her school for writing an essay on the most special woman in her life. 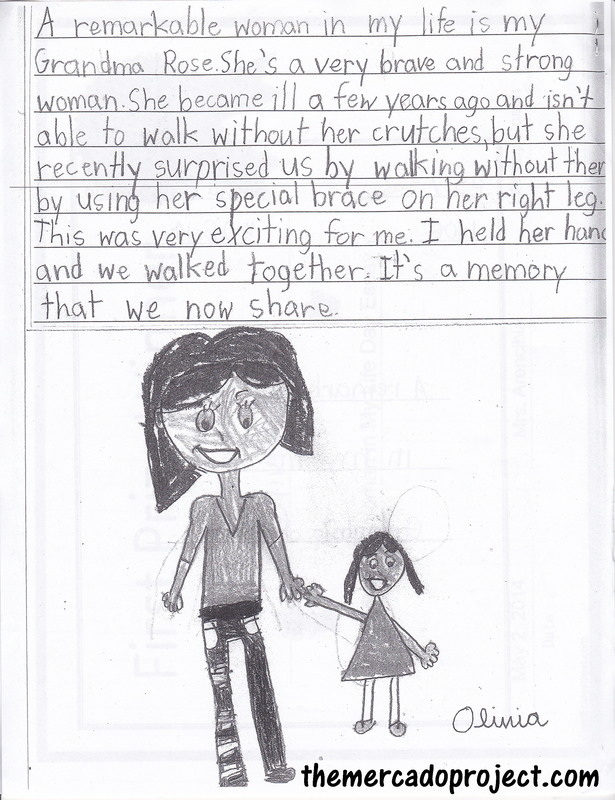 She chose to write about her Grandma Rose (my mom, Rosa). The essay read: A remarkable woman in my life is my Grandma Rose. She’s a very brave and strong woman. She became ill a few years ago and isn’t able to walk without her crutches, but she recently surprised us by walking without them by using her special brace on her right leg. This was very exciting for me. I held her hand and we walked together. It’s a memory that we now share. 4. My oldest daughter turned 7 years old and we had another party at the same bowling alley! 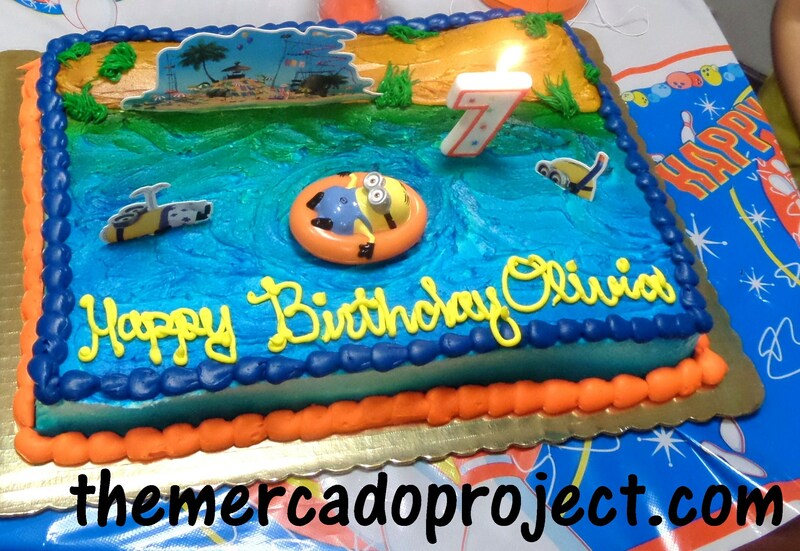 The theme was the Minions from the movie, “Despicable Me” and this time around the cake was store bought (yeah, we got lazy, but the cake was still yummy). 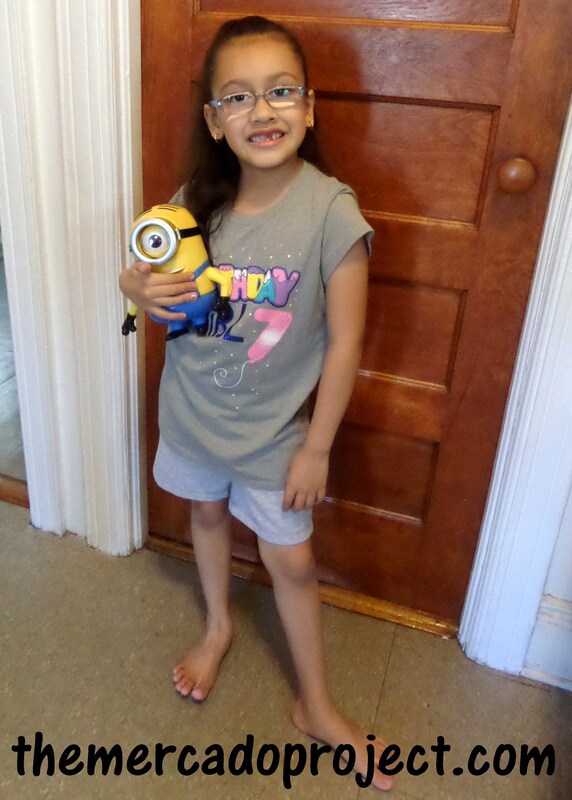 The birthday girl and her Minion cake! 5. 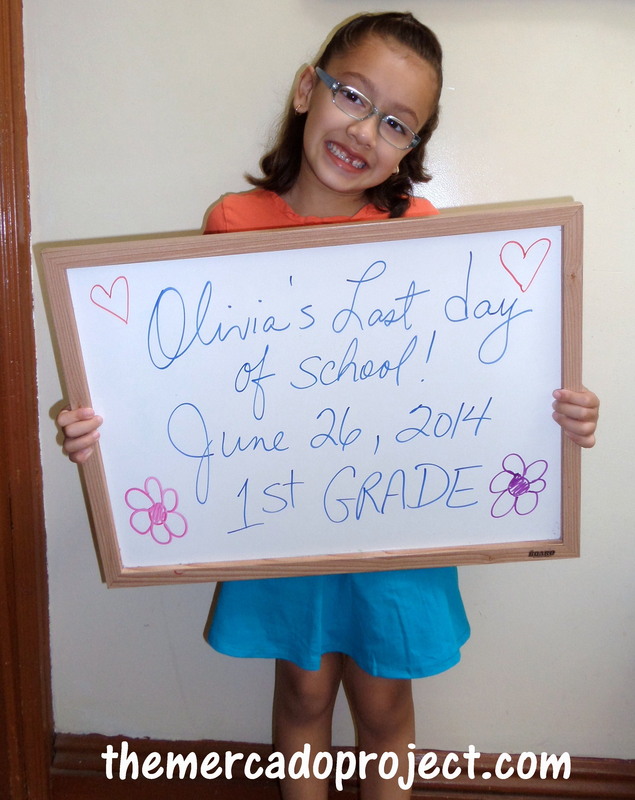 My daughter successfully completed the first grade! 6. 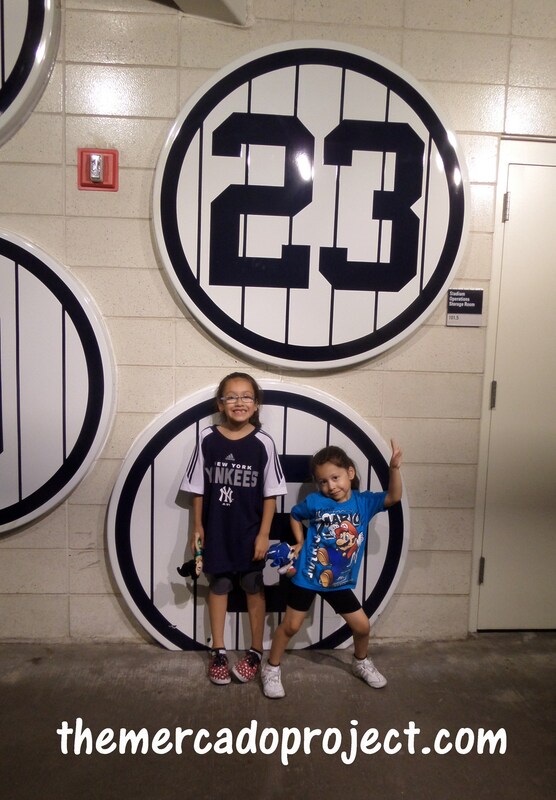 We went to see the New York Yankees play against the Toronto Blue Jays! 7. 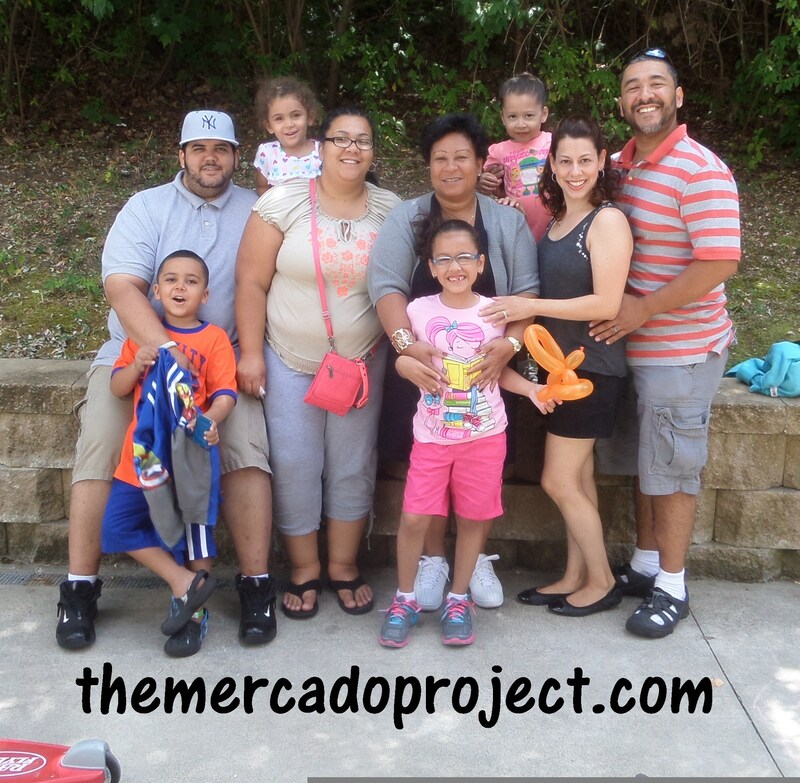 We went on vacation for a week with family to a Pocono resort, The Villas at Tree Tops. We had a lot of fun and great memories were created. 8. Final days of the summer were spent going to the library and spending time with family, then it was back to school! 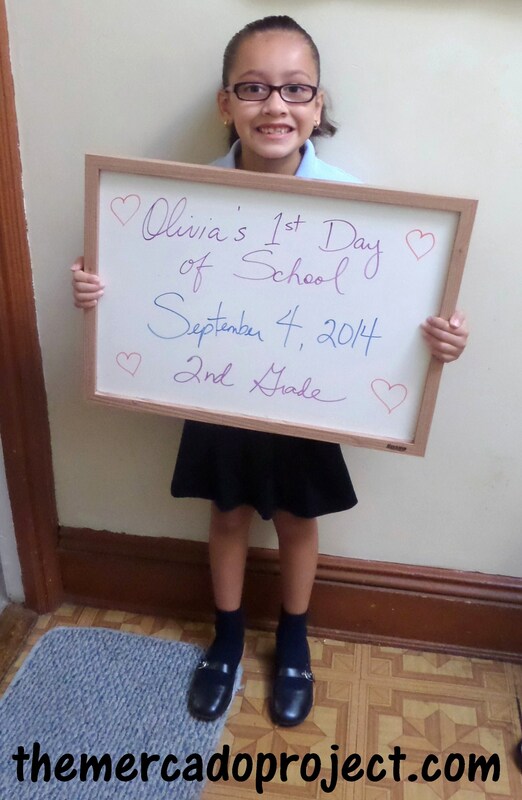 My oldest entered the second grade and I’m keeping my youngest with me at home, even though she can enter Pre-K, but I’ll rather have that time teaching her myself and having fun together before she officially goes off to school next year. So that’s the recap and there are so many things in the horizon, for example, we’re preparing to move (yikes, more on that later on), a Halloween themed baby shower as well as a destination wedding next year in beautiful Puerto Rico. Oh boy! or girl…it’s a surprise, due in November. We can’t wait and I hope to be a better blogger! 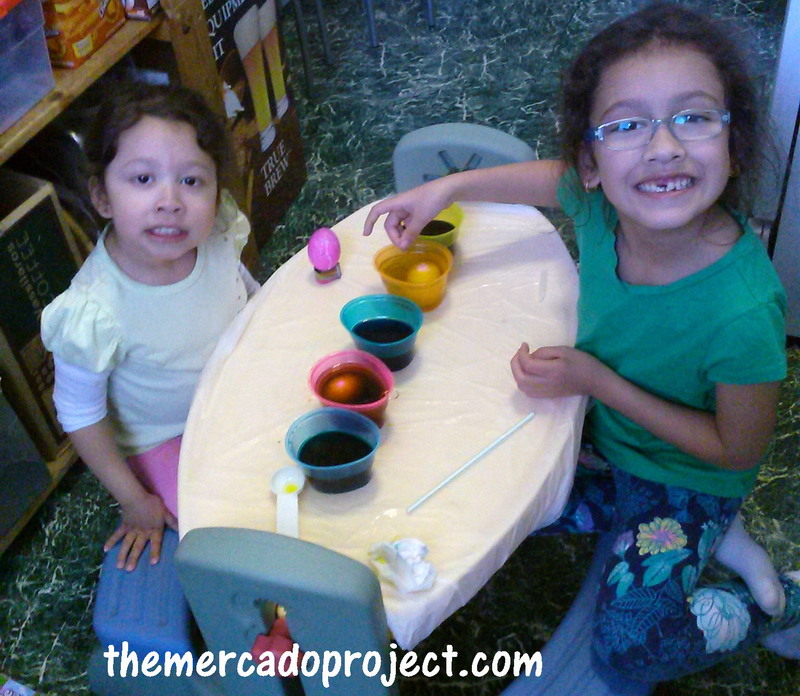 It’s that time of the year…let’s dye some eggs! 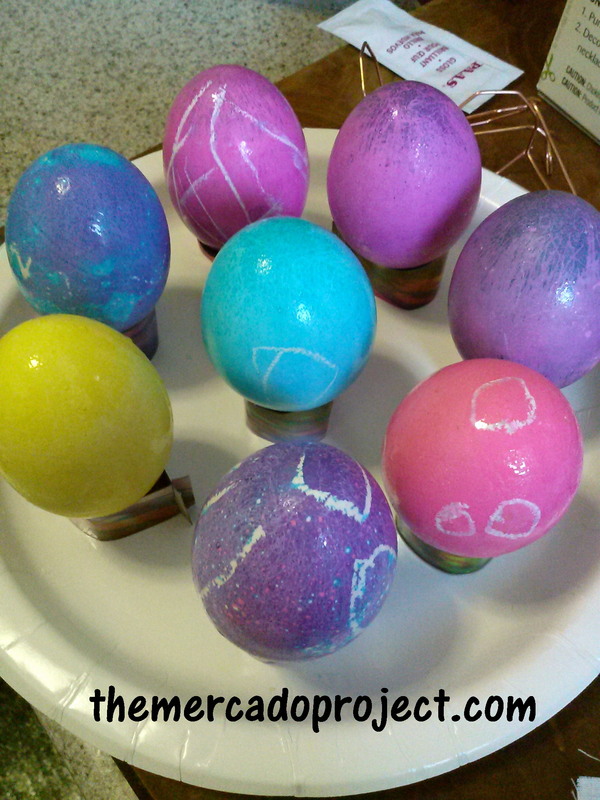 Easter’s fast approaching and the dyeing of the eggs has come upon us. While my girls were being distracted/entertained by the television, I quickly set up everything we needed in the kitchen. 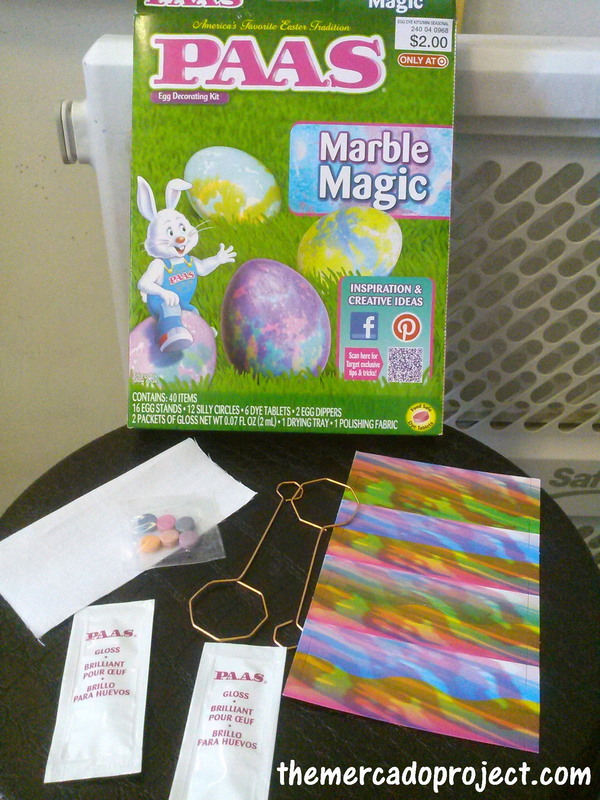 I got the PAAS Egg Decorating kit in Marble Magic. 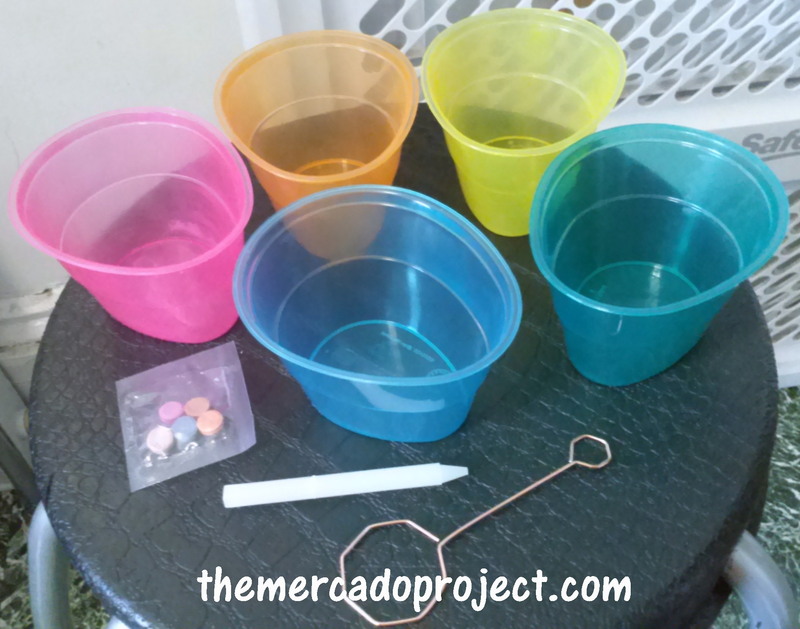 This kit included 16 egg stands, 6 dye tablets, 2 egg dippers, 2 packets of gloss and 1 polishing fabric. 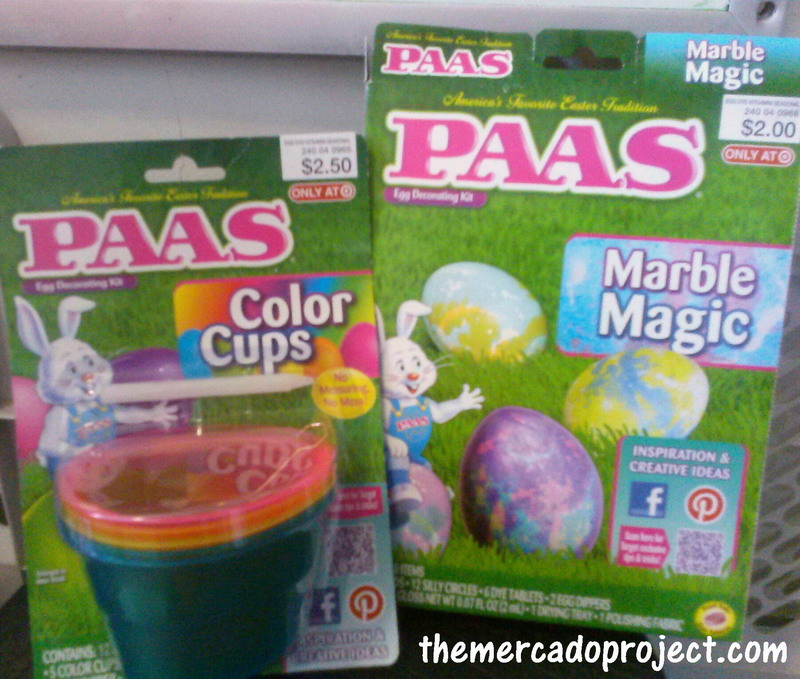 I also got the Color Cups and that came with 5 dye tablets, 1 egg dipper, and a magic crayon. 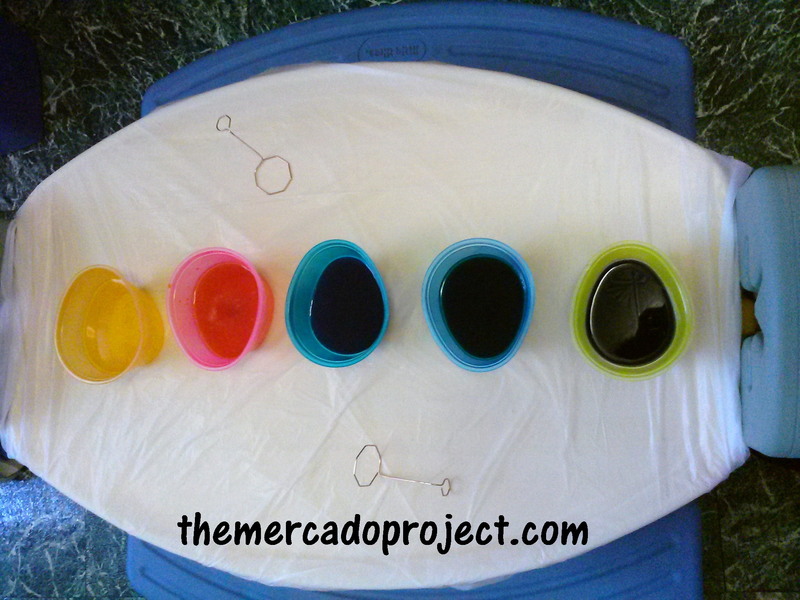 Instead of mixing the tablets with just water, I added a tablespoon of vinegar to half a cup of water so the eggs would dye brighter in color. I also taped down a small, white recycle garbage bag on my girls picnic table so clean up would be easier and there would be no staining on the table. 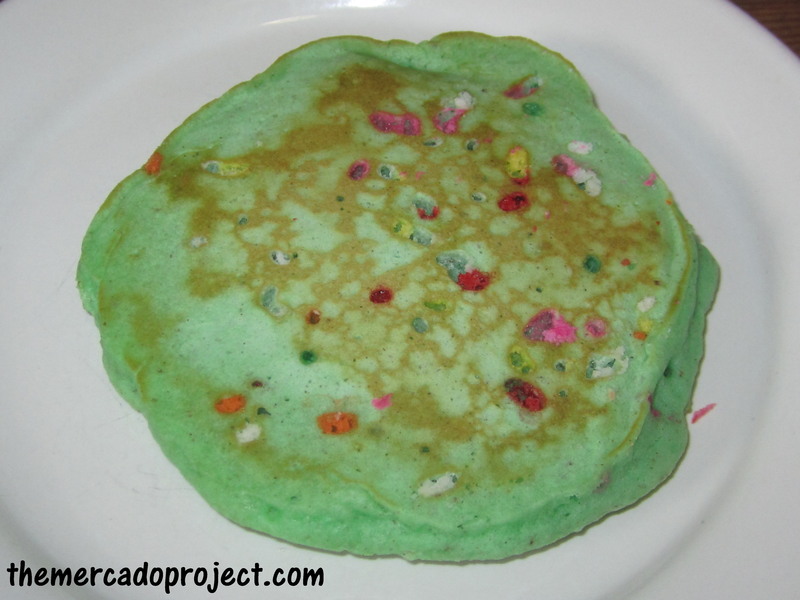 In order to get the marble effect you had to add a tablespoon of oil to the color mixture. We also used the magic crayon to make designs before dunking the eggs in. 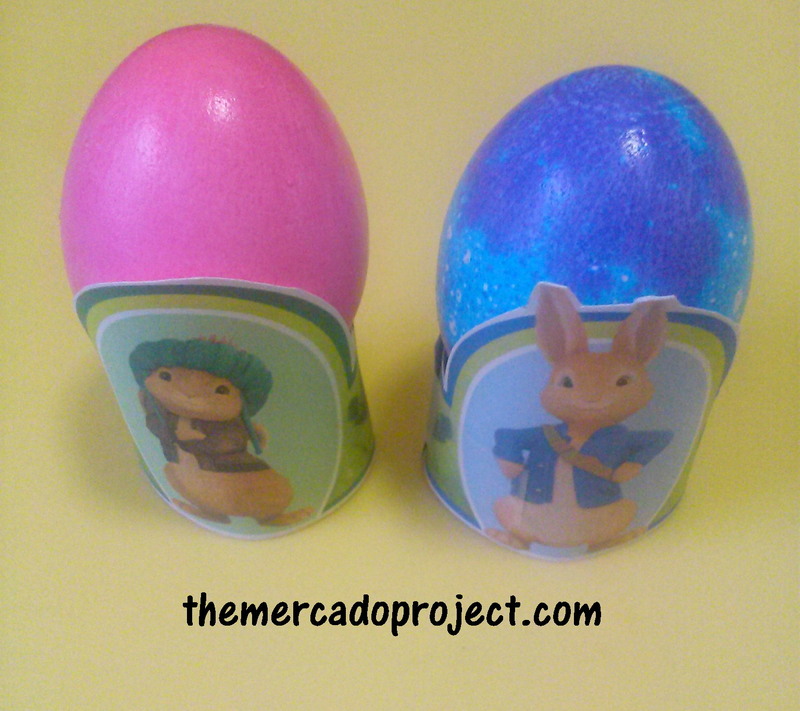 Whatever was marked with the crayon, didn’t dye with color (my youngest drew lines on the purple egg while my oldest drew circles on the pink egg). We used the gloss and fabric to get the glossy effect. 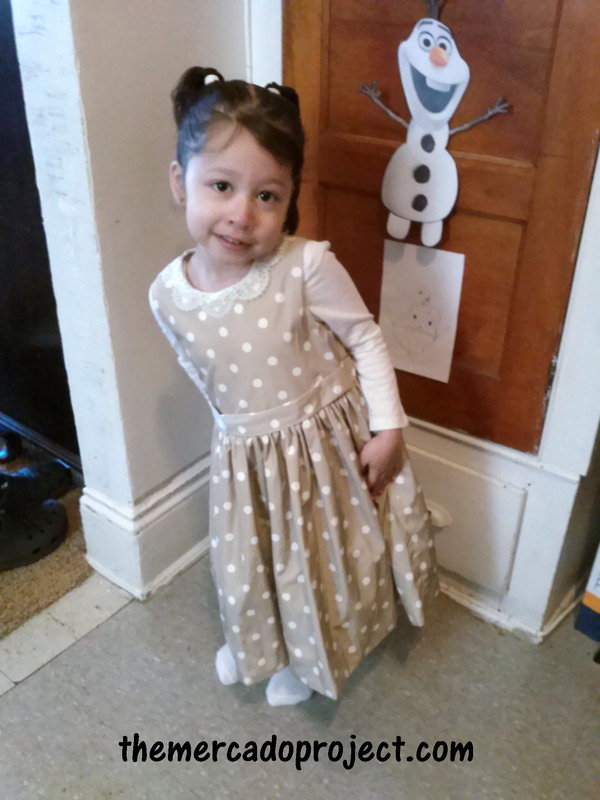 Before we bid adieu to the month of March I wanted to share some pics with you as well as an update on my daughter’s speech therapy. The month started with my family celebrating my mother’s 62nd BIRTHDAY! It’s so wonderful to celebrate her birthday. 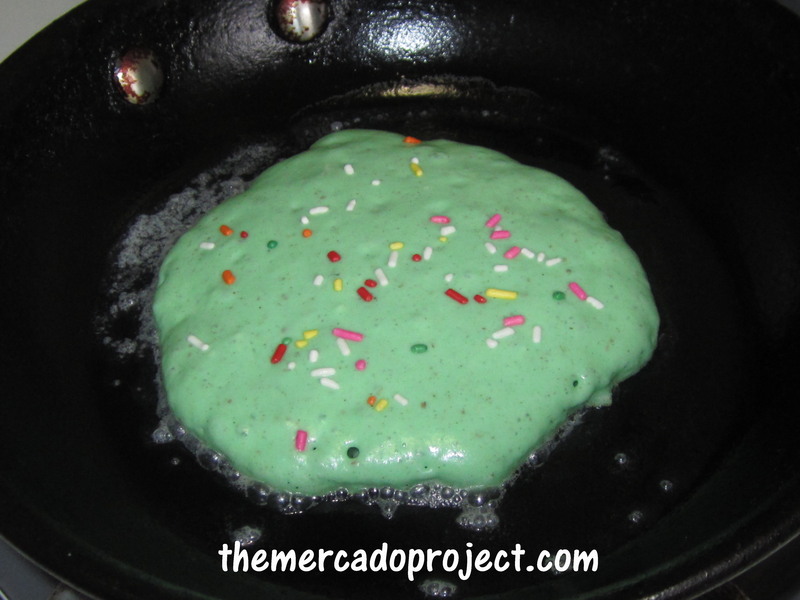 I just used a little food coloring, but totally forgot that the butter was going to brown up the pancakes…oh well, the girls still loved eating green pancakes for St. Patrick’s Day! 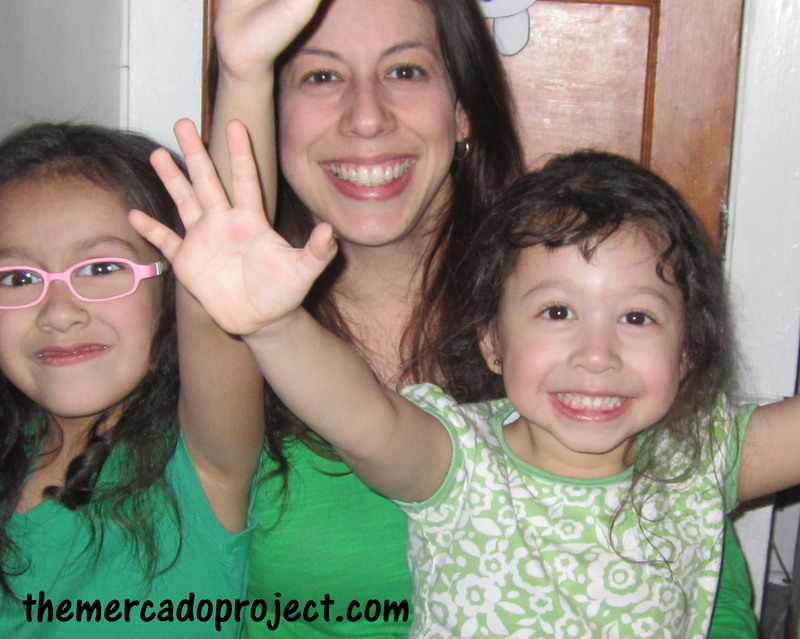 We got our green on…say cheese! Whatever, she still ate it happily…she can be a conundrum sometimes. 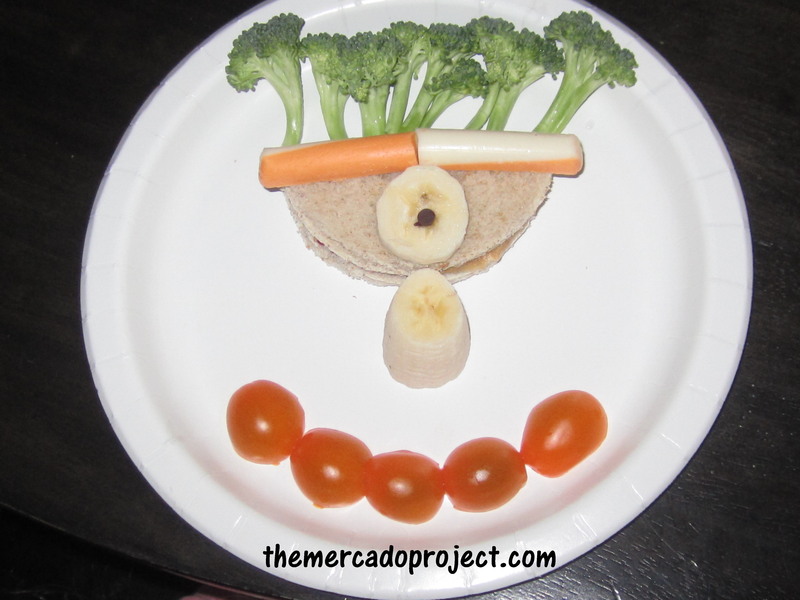 Then on another day she asked me for a one-eyed happy face. Okay, here’s happy cyclops. It’s all about improvising and having fun. She loved this silly face. As for my ongoing quest to get my oldest daughter speech therapy in her school, it has come to a complete halt. Why? Well, I decided to stop wasting time with people who keep giving me the run around or pretend not to know what my case is about. The straw that broke the camel’s back was when, let’s call her an administrator, said to me over the phone, “My hands are tied.” She said it nonchalantly and yes, I could be wrong. Maybe her hands are tied and she simply can’t help me, but at that moment, I lost it. I got emotional, which I hated, but I needed her to know, no scratch that, I needed her to fully feel and understand that all I was asking for was a little help. After that phone call was a bust, I continued my search online and finally found a great website, www.mommyspeechtherapy.com, that offers tips and ideas on how you can help your child with their speech including printables and an app (articulation station), which I got for my ipad. We also practice enunciating our words at home and my husband makes up tongue twisters with the specific letters that our daughter has trouble pronouncing. 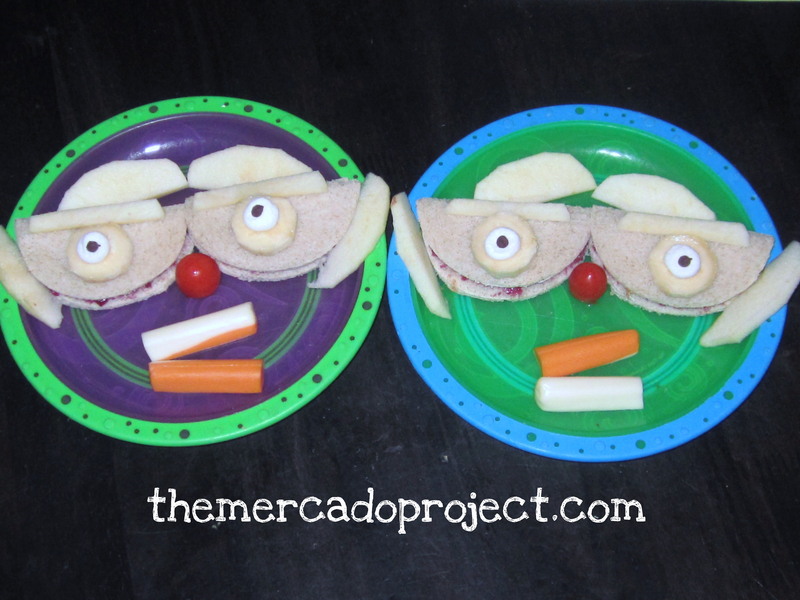 The tongue twisters are very helpful and we make it fun by saying silly phrases. So far that’s what we’re doing and we’re going to continue to research and look into other ideas and I’ll keep you updated. We ended the month celebrating my father’s 62nd BIRTHDAY and were even given a surprise, but more on that later on! 🙂 Again, it’s simply wonderful celebrating his birthday as well. So it is with a fond farewell to the month of March. I can’t wait to share what comes next: april fools day, my youngest daughter’s birthday, spring cleaning, spring break, apartment egg hunting, and Easter. 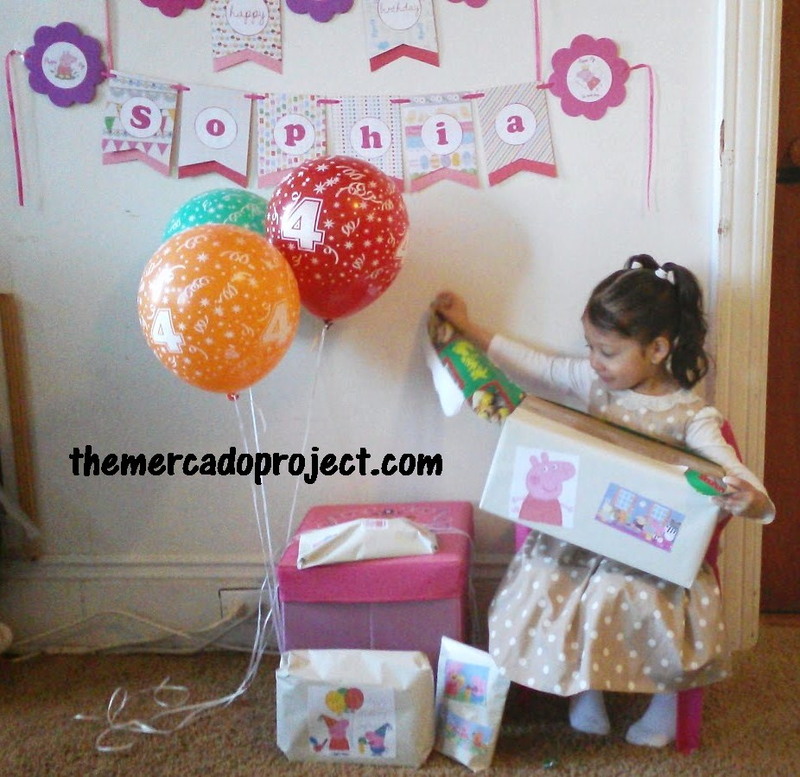 Get the scrapbook paper and scissors out, Mama needs to make a Peppa Pig birthday banner! 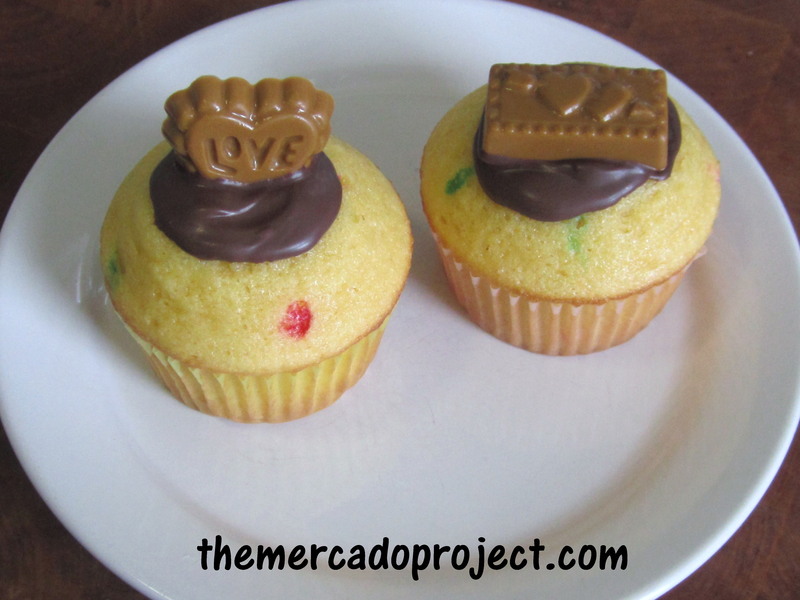 Butter Scotch candy + Funfetti Cupcakes = Yumminess! 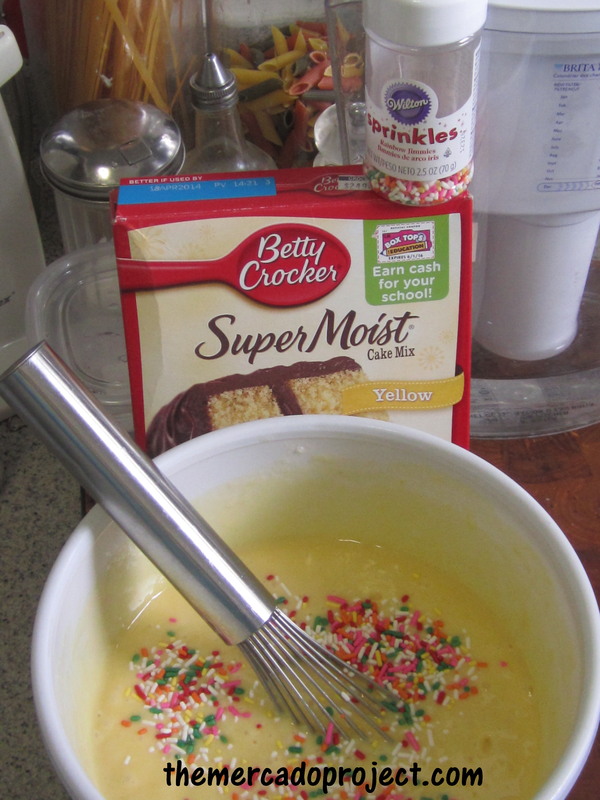 Combine ingredients for cake mix and add sprinkles. 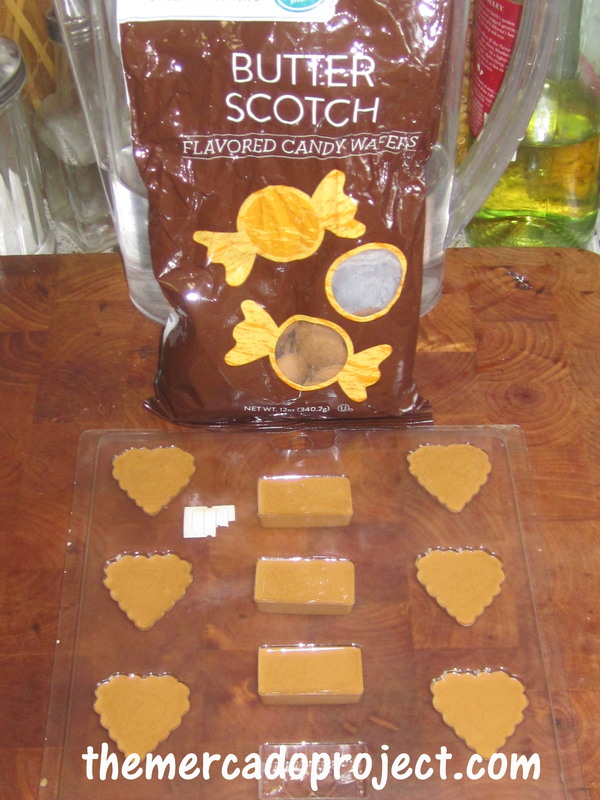 While the cupcakes are baking, melt butter scotch candy (found this at AC Moore craft store) in your microwave and fill candy mold. 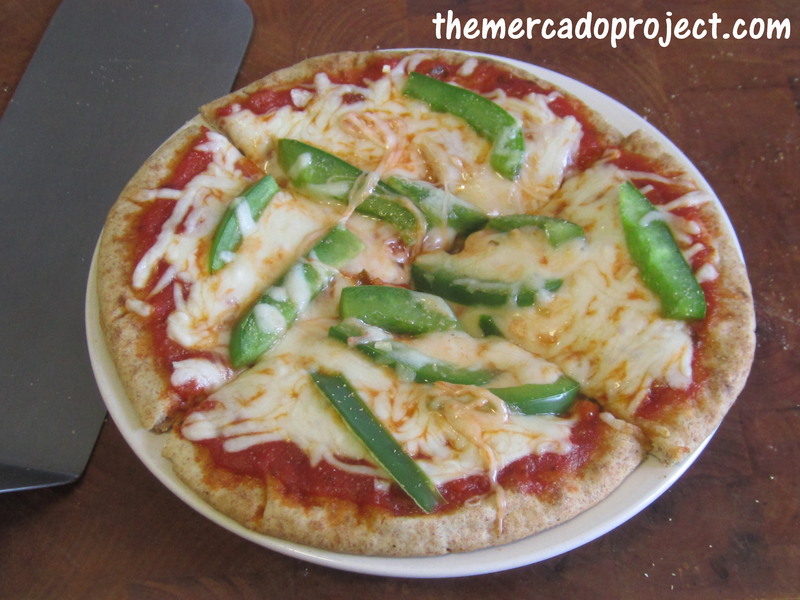 Place into freezer for about ten minutes. I also melted Dolci Frutta chocolate and placed a dollop on each cupcake, then stuck one of the candies on top and placed into the refrigerator for a few minutes so the chocolate could harden. 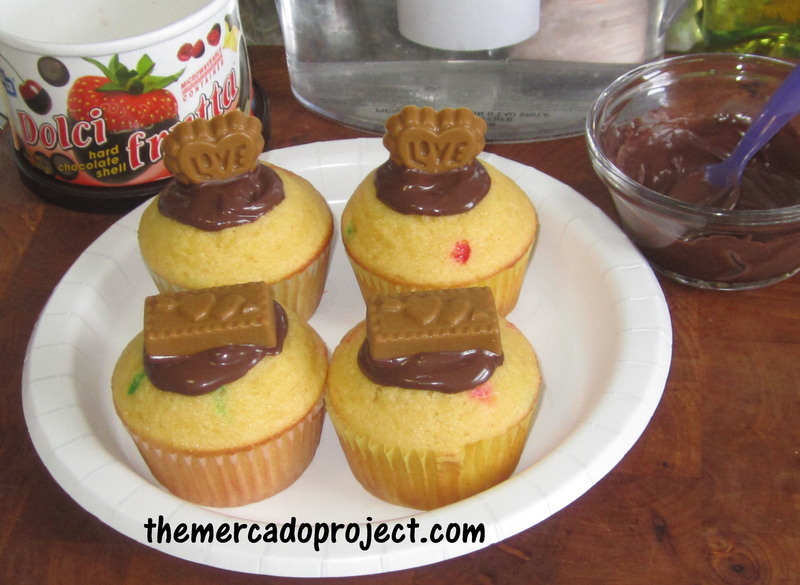 My valentine cupcakes, but you can always make these for any day. 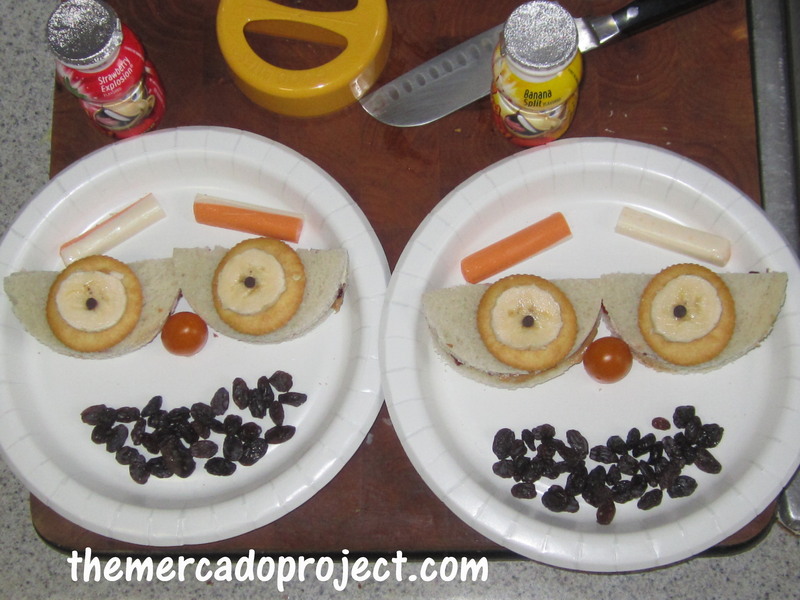 Peanut butter and jelly sandwiches, Ritz crackers, banana slices, mini chocolate chips, cherry tomatoes, a cheese stick, and raisins make up these fun faces. Here’s hoping that the weather clears up soon. We had a snowstorm yesterday and today’s temperature outside is 8 degrees. Yup, eight! So, we did the most logical thing and stayed home. 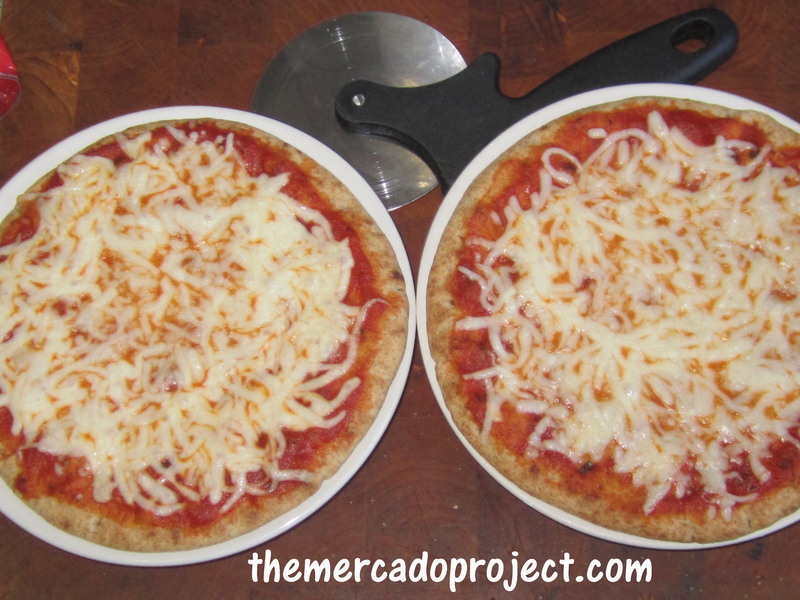 With both my girls running around and enjoying their time together, I decided to make personal pizzas for lunch. 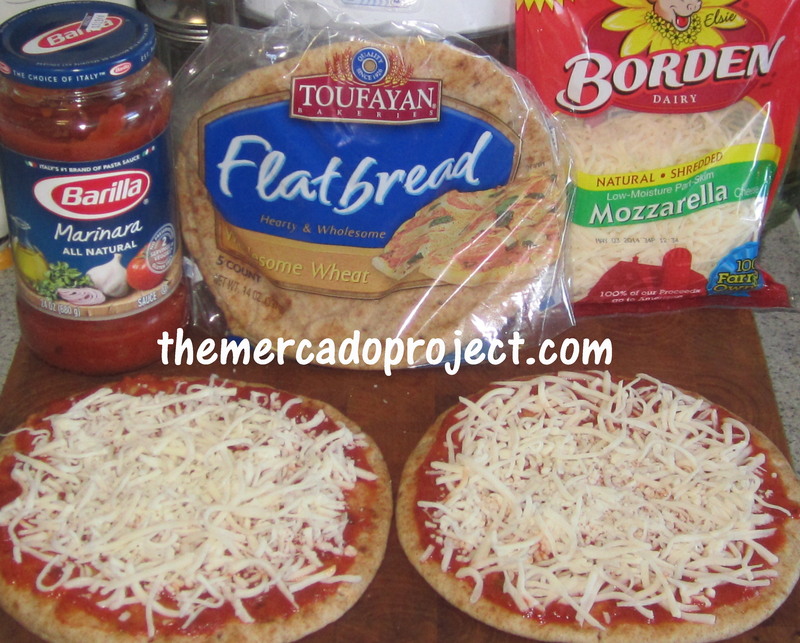 That’s all you need for a cheesy pizza. Of course, you can always add other stuff. 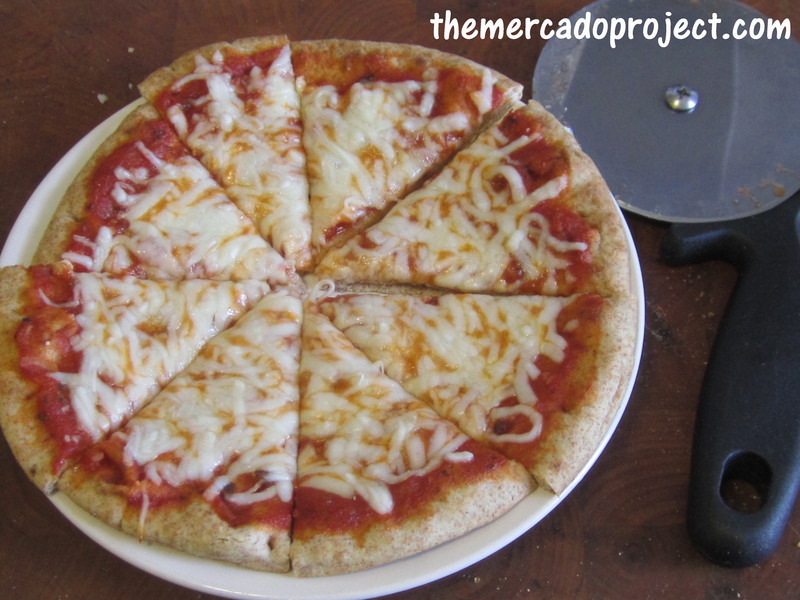 This was my pizza. 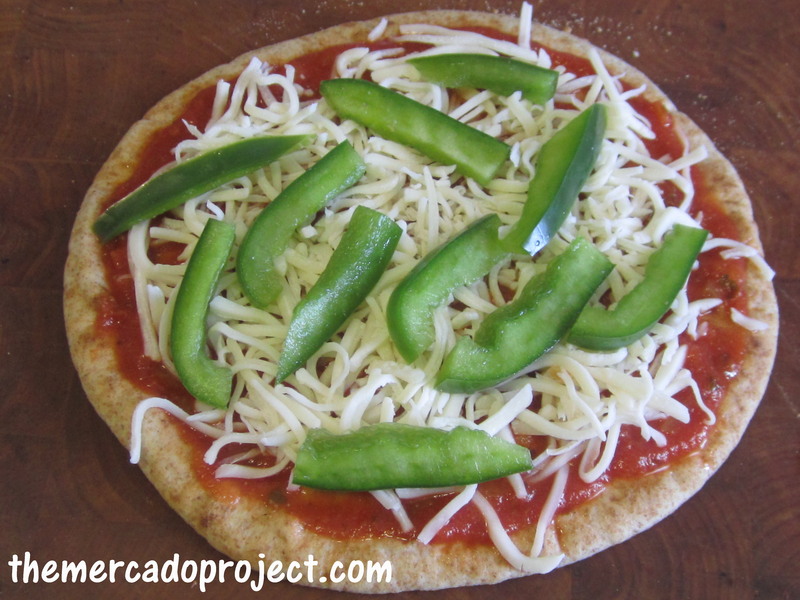 I added green pepper, chopped onion flakes, and garlic powder before putting it into the oven. The holidays are fast approaching and my mind is about to explode. Please SLOW DOWN!! Wishful thinking, I know. 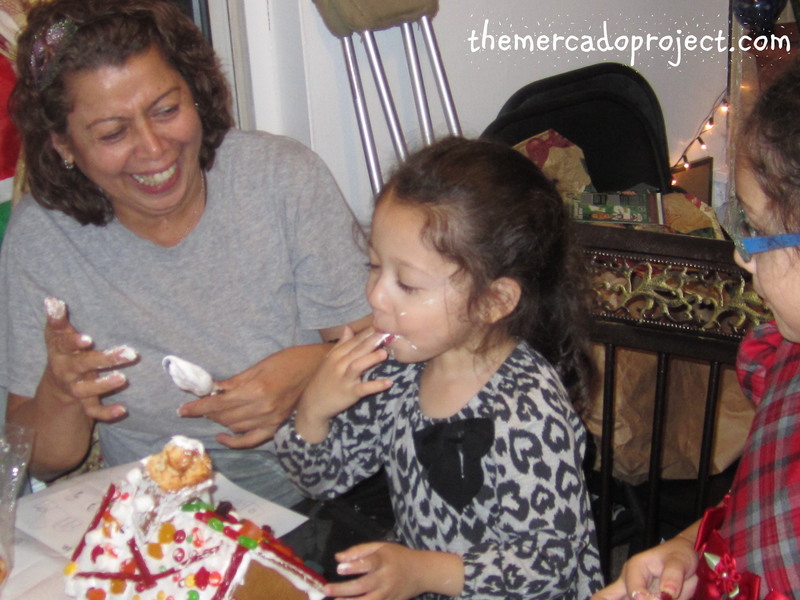 Anyway, the other day we went to my mom’s house and I decided to take a gingerbread kit, which I bought at Ikea (http://www.ikea.com/us/en/catalog/products/90218783/), with us because we’ve never constructed a gingerbread house before and I thought my girls and I would have a lot of fun putting it together with Grandma Rose. That was an understatement because we had a BLAST! …it didn’t work. 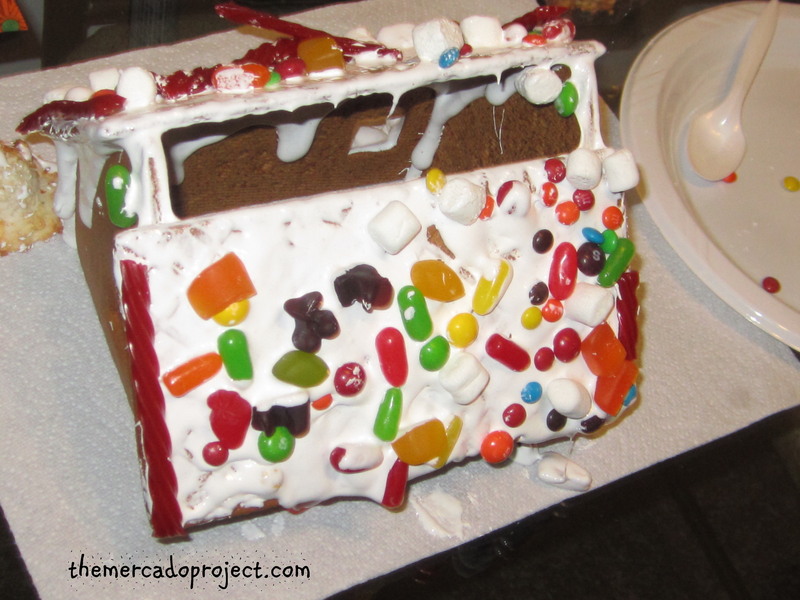 By the end of the night, one side of the roof was falling off and the fluff was melting causing the candies to fall down with it. 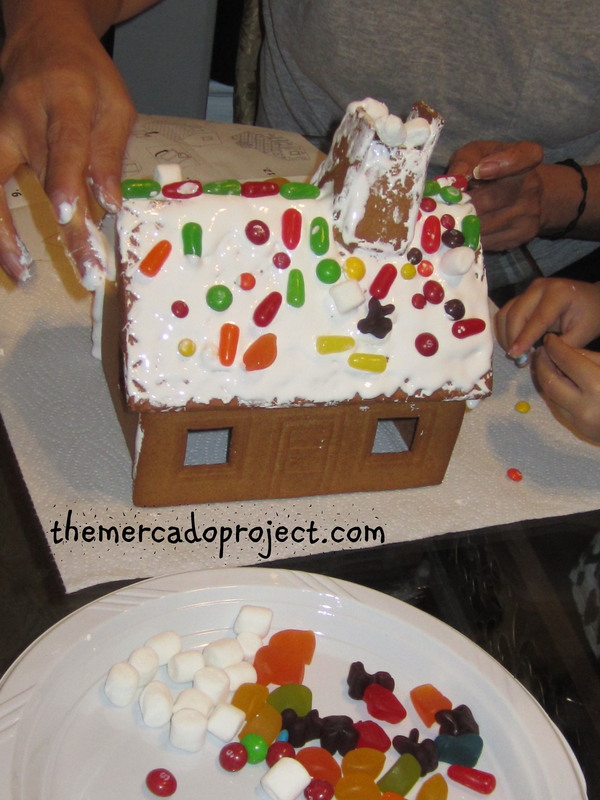 Oh well, we still had so much fun building it and then eating it. 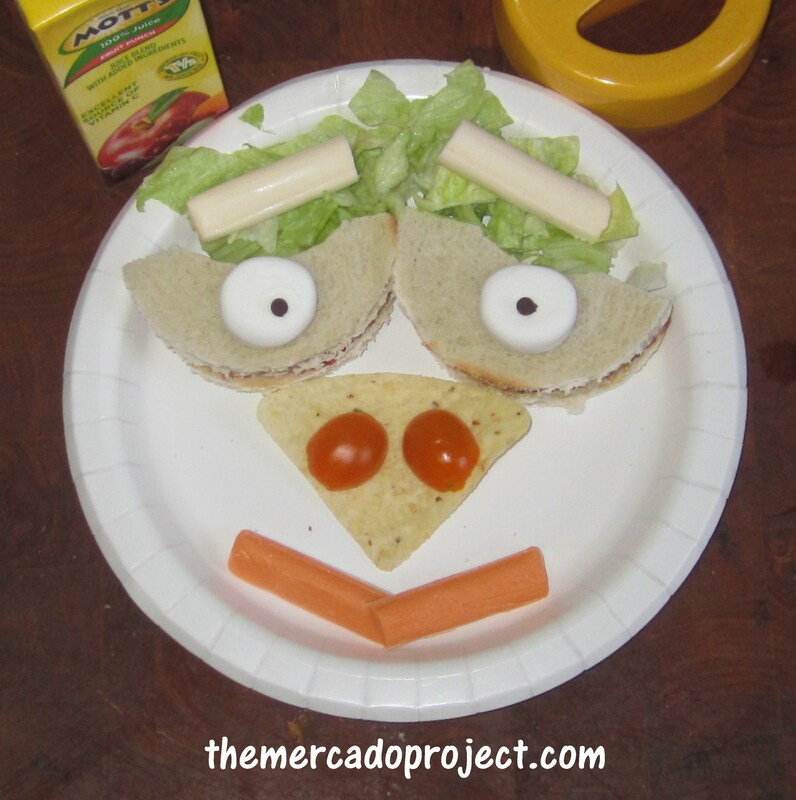 I made this funny face lunch for my oldest daughter today. 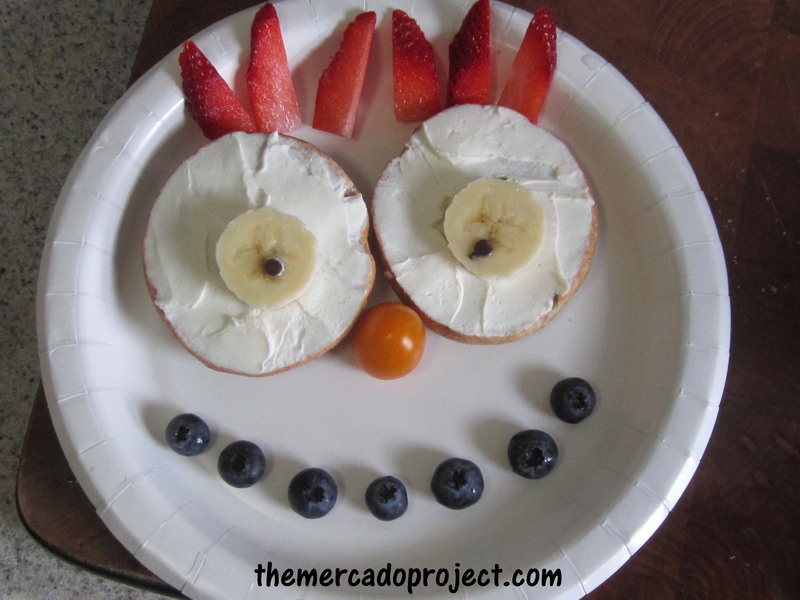 It consisted of a mini raspberry muffin/doughnut, two mayo and cheese sandwiches, apple slices (in a bowl to look like a hat), mini marshmallows, mini chocolate chips, a big cherry tomato, and green salad. I wasn’t able to make another one for my youngest because she was resting due to a fever. 😦 Once she woke up I gave her liquids, Cheerios, and apple slices. I also wanted to say CONGRATULATIONS to my lil’ sis whose been a great supporter of my blog (reading and liking my post entries). 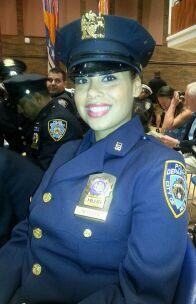 She was promoted today to Detective in the NYPD! We’re very proud of you Detective! Keep shooting for the stars and hitting them hard, but always stay safe! 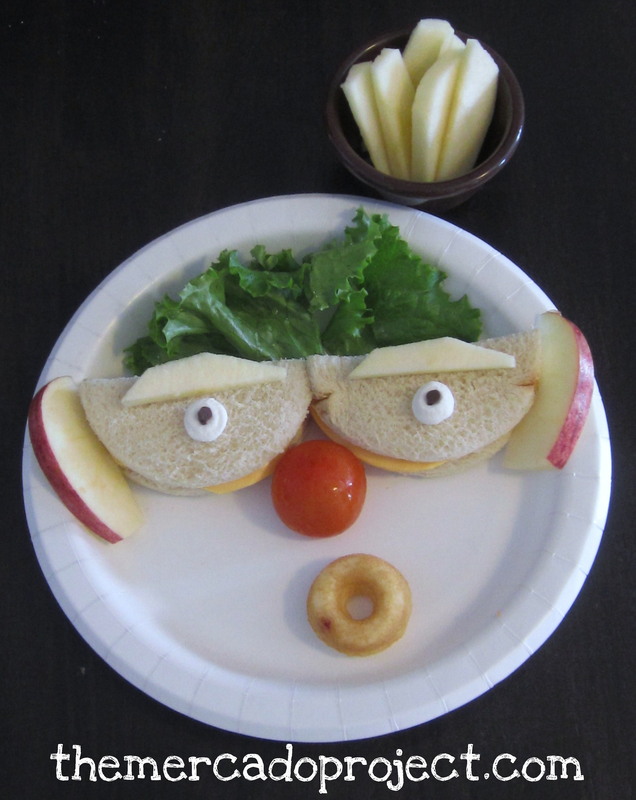 You know I love making funny faces in the form of food for my daughter, Olivia. 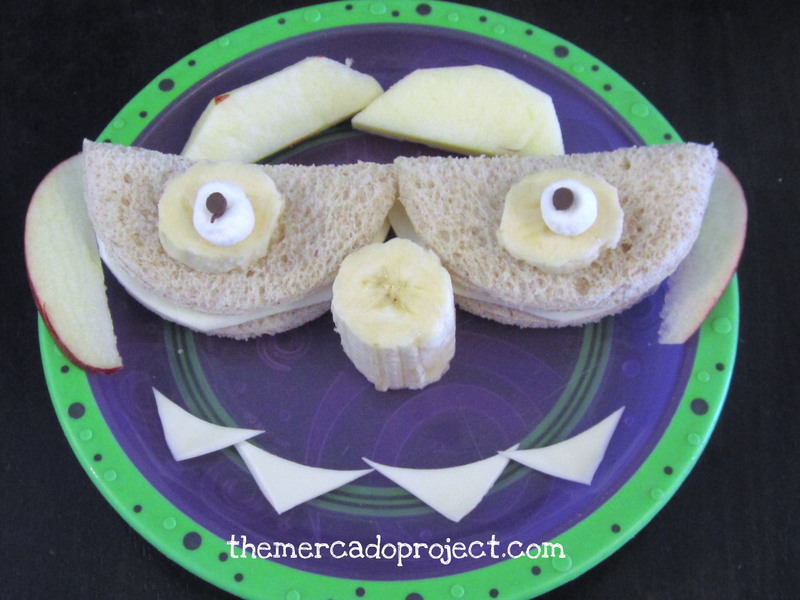 I made this funny face monster (apple slices, banana, marshmallows, mini chocolate chips, white cheese and mayo sandwiches) for her lunch the other day and made something else for my youngest, Sophia. 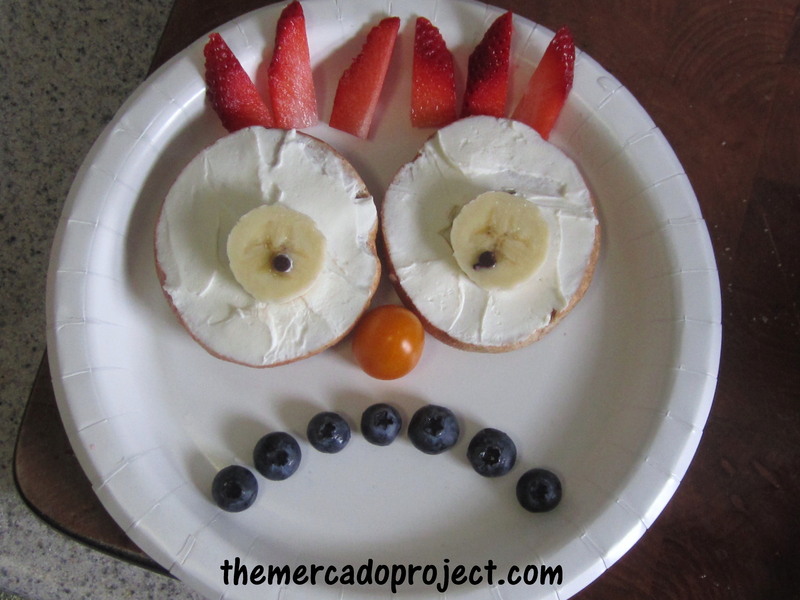 Well, Miss Sophia was not happy that I didn’t make her a funny face lunch as well and the reason why I didn’t make her one is because she can be picky with her food. Here in New York City, we are battling a heat wave. The temperature is above 90 degrees, but the humidity makes it feel like 100 and above. It’s horrible and disgusting. We’re doing our best to entertain ourselves at home with the AC at full blast. 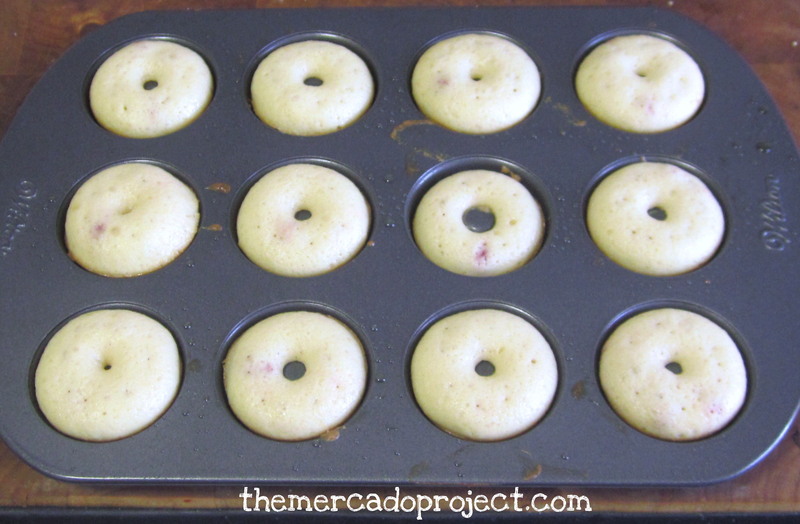 Enter our newest purchase, the Wilton mini doughnut pan, which we got at AC Moore craft store with a 50 percent coupon. My husband fell in love with this pan along with the savings (the current plan is to get a second pan to make it less time consuming). 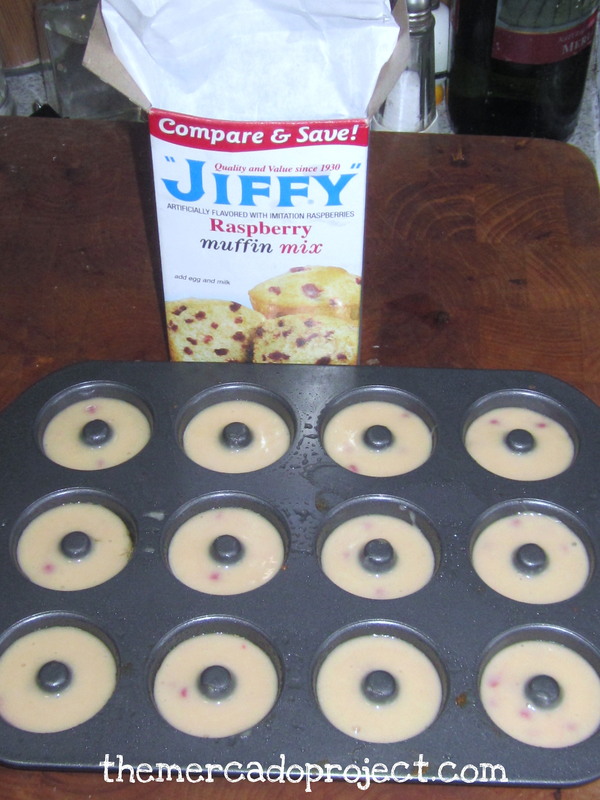 He tried it out first with Jiffy’s chocolate muffin mix, but he forgot to take pictures. When it was my turn, I tried the raspberry muffin mix and it was definitely a learning experience. I was able to make two batches (24 total). The first batch I put too much batter in the pan so the muffin/doughnuts came out like little bowls (open on one side, which is cool because you can put something inside for example whipped cream and eat/present it like that or just eat it as is). The second batch I put less batter but I still got some that came out like bowls. It’s a trial and error kind of thing. I’m figuring that with more batches I’ll get the right consistency one day. 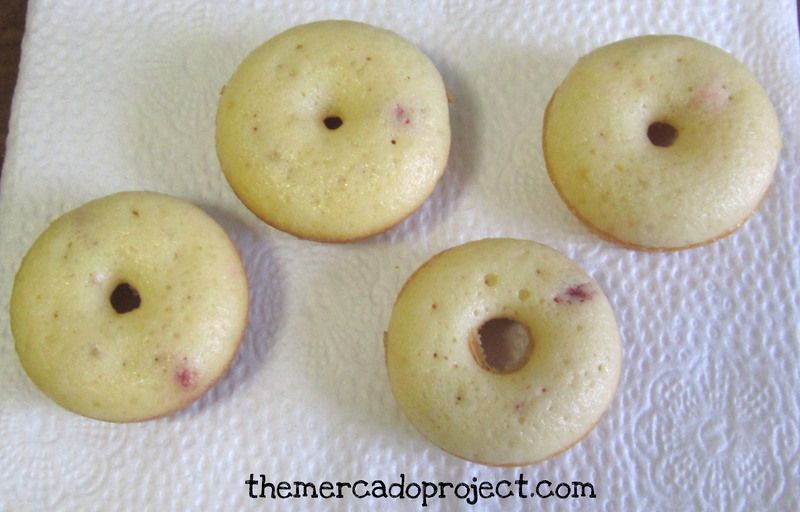 I’m looking forward to making cake doughnuts, that’s next, and of course finding a good doughnut recipe to try. Duh! In the meantime, these muffin doughnuts were delicious and a big hit with my daughters. I also like that they’re small so consumption can be kept under control.